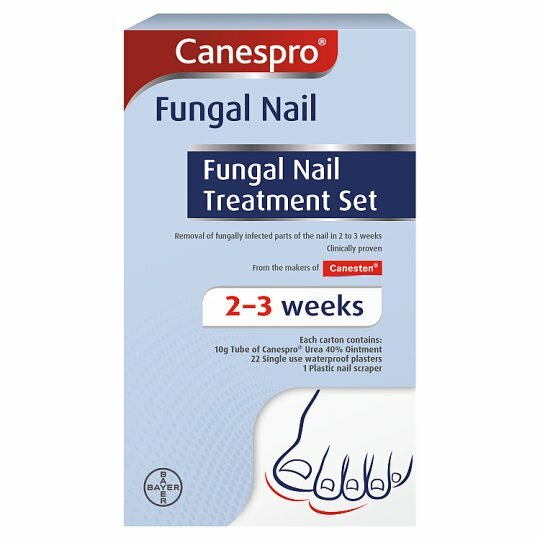 Canespro Fungal Nail Treatment Set is used as part of a topical treatment for the removal of fungally infected parts of toenails and fingernails. 22 Single-use Waterproof Plasters 1 Plastic Nail Scraper. Fungal nail infection, medically known as onychomycosis, may begin as a white or yellow spot under the tip of your nail and as it spreads, the nail may discolour, thicken and develop crumbling edges. Canespro Urea Ointment selectively softens the parts of the nail infected by fungus, leaving the healthy parts intact. The plasters are used to cover the urea ointment applied to the nail. The scraper is used to remove the softened infected parts of the nail. 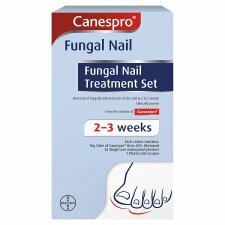 Canespro Fungal Nail Treatment Set is clinically proven. Before applying the ointment, the affected hand or foot should be soaked in warm water for approximately 10 minutes. Dry thoroughly. 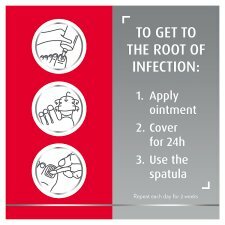 Apply the ointment to the surface of the infected nail once daily. Apply enough to cover the infected nail areas with a thin layer. To cover the infected nail with a plaster, gently place half the plaster over the treated nail then fold over the sides of the plaster around the toe or finger and press. For smaller fingernails or toenails, cut the plaster in half. Take care not to touch the sticky surface of the plaster with your fingers or with the ointment as this will help it stick better. Fold over the other half of the plaster over the back of your toe or finger. Again, fold over the sides of the plaster around the toe or finger and press. The plaster will fit like a protective cap over the affected nail. Remove the plaster after 24 hours and soak the nail in warm water for approximately 10 minutes. After soaking, remove the softened infected parts of the nail using the plastic nail scraper. Hold the plastic nail scraper firmly by gripping the broad handle (smooth and blunt end) only. Use the sharpened and serrated edge for scraping. Clean the scraper with water thoroughly after each use. Keep the plastic nail scraper until treatment is complete. Dry the treated nail(s) thoroughly. Canespro Urea Ointment and a fresh plaster should be applied daily for 2-3 weeks, as described in steps 1, 2 and 3. FOR EXTERNAL USE ONLY Use on toenails and fingernails only. Avoid contact with the eyes, mucous membranes and skin. Do not swallow or put in the mouth. Do not use if you are allergic to any of the ingredients. Keep out of the reach and sight of children.